Documents Are Everywhere — MongoDB’s CTO Eliot Horowitz takes a technical look at the competition (specifically AWS’s recent DocumentDB service) in the document database world. The conclusion? 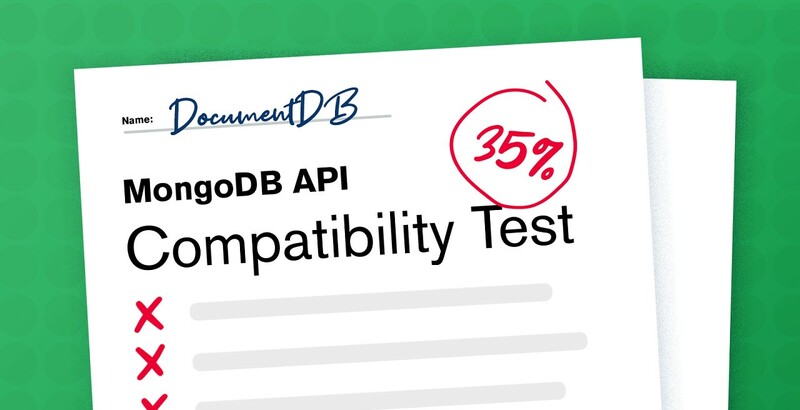 While DocumentDB has some use cases and offers MongoDB protocol compatibility, it only passes 35% of MongoDB’s correctness tests and is outperformed by Atlas on most workloads, particularly those heavy on writes or that use sophisticated queries. The Future Will Be Documented — MongoDB CEO Dev Ittycheria explains “why it’s now clear that the document model is the best way to work with data” and “that documents, not tables, are the future.” A feature by feature driven comparison with AWS DocumentDB follows. MongoDB Schema Design Patterns: The Polymorphic Pattern — The first in a new series of posts covering different ways to approach designing schemas that work well in MongoDB. We start with the polymorphic pattern which is well suited when all documents in a collection are of a similar but not identical structure. Taking Advantage of Change Streams for Real-Time IoT Apps using Node.js — A short tutorial with sample code based on one developer’s experience with Node and MongoDB. Mongo Playground: A Self Hosted Tool to Play with Mongo Queries — A Node powered locally hostable tool for making queries against a MongoDB server from a Web page. MongoDB Atlas Workshop – Toronto, Canada (January 30) — A free day of hands-on training to help you/your team use MongoDB Atlas.